The Europeans were treasure hunters. British, German and French teams were scouting the world for treasures of cultural merit and a lot got collected, both legally and illegally, and there was none to stop the White man on his shopping spree. For no one really cared, everyone was in economic strife even at that time. The French collector Vervier came across some objects and art works in Ispahan and bought them.One was a painting dated 1232 AD. The most remarkable thing it was dated and the other remarkable thing it was one of the earliest painting known of Lahore region, and it was dated just 22 years after the death of the Sultan. The Sultan of course was Qutb-ud-din Aibeg, the Flaming Star of Lahore. And he sits with his wife and three girls and son in law and his young son namely Aram Shah. He was the only Sultan of those times on which the painting fits in every way. The whole family is in picture there. 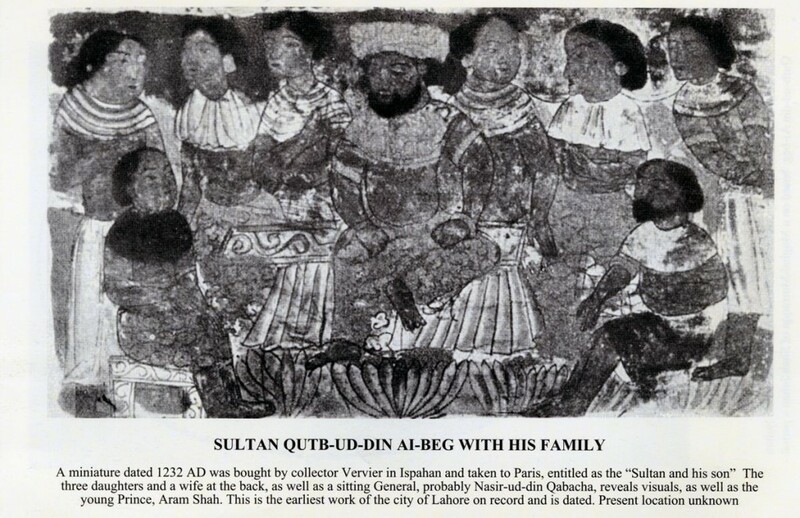 We know that his son in law Sultan Iltutmish also commissioned paintings in the Chinese style from probably Mongol artists who had come to India from Mongolia itself, the Changez Khan School of painting, which is a separate story in itself. Vervier noted the Indian elements in the painting. The stamp of the Lahore School painting was visible there, and highlights the statement of the historian Baihaqi, who said that 200 different professionals came from Ghazni to settle in Lahore. The professionals included even silk lace makers, a fancy profession for those times. And even lion tamers to this region. Unfortunately the present location of the work is not known, but suffice it must be in some private collection even today. Till we know more, enjoy the Lahore School of Painting. It is also possible that it was attached to a manuscript copy of the TAJ UL MATHIR of Tajuddin Hassan Nizami, the earliest biographer of the great Sultan of Lahore. The ‘chinese’ thing is imminent from a mile … with faces which fall into both indian and chinese lineage .. Thank you! You got a good eye indeed.